Situated in the heart of Istanbul, Hagia Sophia (meaning ‘Divine Wisdom’), was originally built as an Eastern Orthodox cathedral. It was later converted into a mosque (masjid) when the city was conquered by Sultan Mehmed II in 1453 CE. It remained a mosque until 1931 when it was turned into a museum. For almost a thousand years, Hagia Sophia (Turkish: Aya Sofya), was the largest enclosed space in the world and regarded as an engineering marvel. It was designed to impress the strength and wealth of the Byzantine emperors upon their own subjects and visiting foreign dignitaries alike. Hagia Sophia is the third church of this name to stand on the site. The first, a wooden basilica built in 360 CE, was totally destroyed during a riot. The second, a grand marble structure of which some fragments remain, was erected under Theodosius II in 415 CE. Like it’s predecessor, this too was razed to the ground, in the Nika Revolt of 532 CE. The magnificent building seen today was commissioned in the sixth century by Emperor Justinian. He was determined his creation would exceed in size and splendour the ‘Temple of Solomon’ in Jerusalem. Work started in 532 CE and the building was inaugurated in 537 CE. The building was therefore present during the lifetime of the Prophet Muhammad (peace and blessings of Allah be upon him). In 558 CE, part of the great dome collapsed in an earthquake. During reconstruction the height of the external buttresses at the door was increased, and some of the windows blocked, resulting in an interior much gloomier than originally intended. The dome collapsed again in 989 CE and was rebuilt by an Armenian architect. The worst desecration, however, was in 1204 CE, when it was ransacked by Catholic soldiers during the Fourth Crusade. Mules were brought in to help carry off silver and gilt carving and a prostitute was seated on the throne of the patriarch. In 1452 CE, the Byzantine Church reluctantly accepted union with the Catholics in the hope that Western powers would come to the aid of Constantinople against the Turks. In 1453 CE, those who said that they would rather see ‘the turban of the Turk than the hat of a cardinal in the streets of Constantinople’ got their way when the city was captured. Mehmet the Conqueror rode to the church of Aya Sofya and stopped his troops looting the holy buildings. He then had it cleared of relics and said his first prayer on the following Friday. The former bastion of the Byzantine Christian Empire was now a mosque. In 1935, the building was transformed into a museum by Mustafa Kemal Ataturk, the founder of the Republic of Turkey. The prayer carpets were removed and the white plaster covering Christian era mosaics were cleared. Use of the complex as a place of worship (either by Muslims or Christians) became prohibited. However, since 2006 the Turkish government has allowed the use of a small room within the complex as a place for prayer for Muslim and Christian museum staff. In July 2016, the adhan (call of prayer) was broadcast from its minarets during Ramadhan, the first time the adhan was called in 85 years. Emperor Justinian appointed the architects Anthemius of Tralles and Isidore of Miletus realise his dream, to create a building of a type and scale unknown in the Byzantine world. The vast thirty-one-metre-diameter dome, which seems to hover over a seemingly empty space rather than being supported by solid walls, was unprecedented. Numerous marble pieces and columns of different shapes and sizes dating back to more ancient times were brought in from ruins all around the empire and used in the building. There are many stories about the origin of these materials, especially the columns, but none of these can be taken seriously. Despite its uniqueness and magnificence, the building had many structural problems and parts of it would collapse. This necessitated expensive repairs which meant over time maintenance work would not be done resulting in a dilapidated state. Extensive strengthening work was carried out in the 16th century under the Turks by the famous Ottoman architect Mimar Sinan. He also erected two large minarets at the western side of the building to supplement two other minarets that had been built under the rule of Bayezid II. A golden crescent was mounted on top of the dome. More restoration work was carried out in 1739 CE under Sultan Murad I. In addition, a madressa (Quran school), soup kitchen, library and ablution fountain were added to the complex. Over the centuries, the Hagia Sophia was decorated with mosaics depicting Jesus, the Virgin Mary, saints and emperors or empresses. During the Fourth Crusade in 1204 CE, many of these mosaics were removed and shipped to Venice. After the Ottoman occupation, remaining mosaics were whitewashed or plastered, as the church was transformed into a mosque. 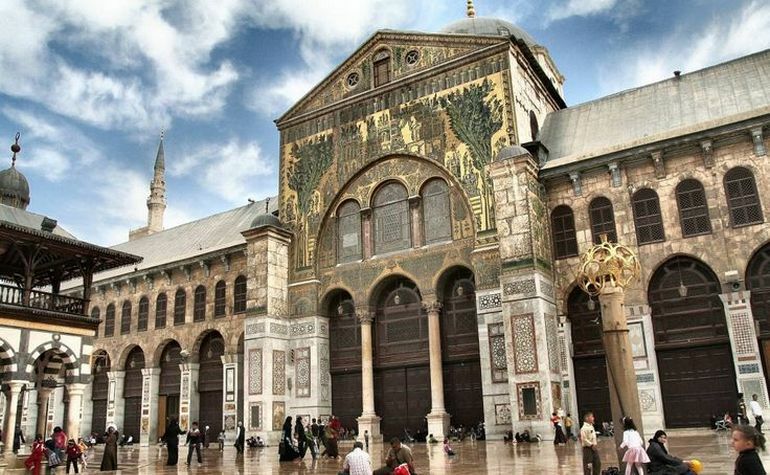 Extensive restorations were carried out on the mosaics in the mid-nineteenth century by the Swiss Fossati brothers, but due to Muslim sensitivities the mosaics were later covered over again. Some of the mosaics have been recovered and restored since the building was turned into a museum. The church apse was made into a mihrab (prayer niche facing Makkah) as part of its conversion into a mosque by the Ottoman Turks. Sulayman the Magnificent installed large candlesticks on either side of the mihrab which were brought from his conquest of Hungary. The giant, circular calligraphy discs seen above were installed as part of the restoration work carried out by the Fossati brothers in the mid-nineteenth century. Inscribed on them are the names of Allah, Muhammad (ﷺ), the first four caliphs Abu Bakr, Umar, Uthman and Ali, and the two grandchildren of the Prophet, Hassan and Hussain (may Allah be pleased with them). Over the past few years there have been several campaigns calling for the Hagia Sophia to be converted back to a mosque. Turkish president, Recep Tayyip Erdoğan, recited the Quran in the Hagia Sophia in 2018. He dedicated the prayer to the “souls of all who left us this work as inheritance, especially Istanbul’s conqueror“.